I'm Steve Boggs, I am an artist from Tennessee. I have been painting for over 25 years, working predominately in oils and painting the things that I see around me everyday. Hopefully you will enjoy viewing my work. And of course please feel free to add comments, or select the link on any painting if you are interested in bidding on or buying. You are also welcome to contact me about purchasing or commissioning a painting. Click here to see comments from people who have purchased my work. 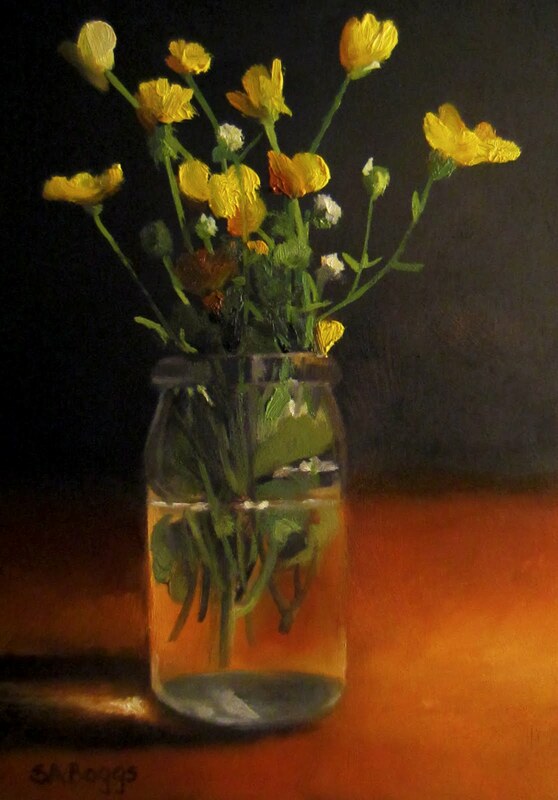 The subject is yellow wildflowers in a glass jar. I picked these flowers by the side of a country road a few miles from my home. This painting is a companion painting to a wild daisy painting that I did earlier in the week. The yellows of these little flowers is very intense against the dark background that I put behind them when painting. Hope you enjoy them. Sign up to receive an email when I create a new painting. One's art goes as far and as deep as one's love goes. Copyright 2006 - 2013. Steven Allen Boggs. All rights reserved. Powered by Blogger.